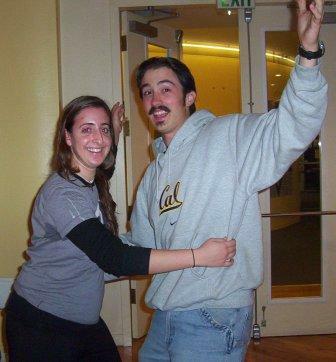 We meet at the Hillel (Jewish student center) on the UC Berkeley campus. Hillel is located at 2736 Bancroft Way, near Piedmont Avenue. A Google map is provided here. We meet in the Auditorium, which has a spring-wood floor and a high-quality audio system. The class has an informal structure. The instructors are students, just like you! We try to be very friendly and approachable. Each day in class, we learn new dances (anywhere from 1 to 3, depending on the difficulty), and we review dances from previous weeks. We'll talk a little about the significance of each dance. Remember, Israeli Dancing is fun, so we have a good time. Proper attire: Think, comfortable. Jeans and a T-shirt work great. Skirts, not so much. You'll want to wear comfortable shoes (tennis shoes)—basically, something you could go running in. Lots of jewelry is discouraged (too easy to catch on something as you're doing a leap-turn or something). You get to choose whether you want to take the course for 1 unit or 2. Of course, if you don't need units, you're welcome to just audit the course. For the 1 unit course, it takes 1.5 hours per week, plus 3 hours of special events. Altogether, that's 26 hours. For the 2 unit course, the readings shouldn't take more than 2 hours all together, the café evening 2 hours (include travel time), and the book & essay 8 hours. That's an additional 12 hours over the course of the semester. Keep in mind that university policy stipulates that each unit should take 45 hours over the semester—yes, we're much less than that. Great! Go to the Enrollment page.